The BERMAD Model IR-920-M0-55-bK integrates a vertical turbine Woltman-type water meter and a diaphragm actuated hydraulic control valve. 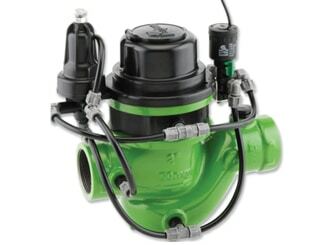 Serving as Flow Meter and Main Valve, it controls irrigation together with the irrigation controller. The BERMAD Hydrometer accurately reduces higher upstream pressure to very low and stable preset downstream pressure. It either opens or shuts in response to an electric signal. establishes reduced pressure zone, and controls irrigation shifts.